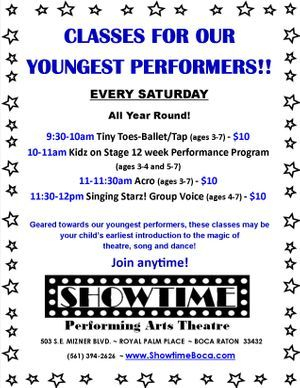 Showtime Performing Arts Theatre is celebrating its 12th year in the Royal Palm Plaza in beautiful downtown Boca Raton. Our award-winning teaching and performance facility is proud to present a full season of children’s and adult musical theatre productions. Our 120-seat theatre also houses five instructional studios for private or group classes in dance, acting, music and vocal recording. Winter, Spring and Summer Performing Arts Camps are also offered. Come see why we're voted Best Children's Theatre in South Florida and Best Academic Arts Program in Palm Beach County!